Legal Tort Definition in Personal Injury Law - Is Tort a Crime? 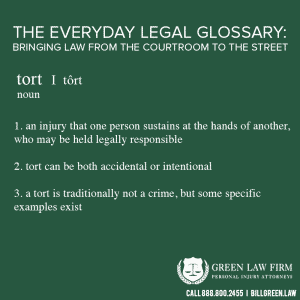 What Does the Legal Term Tort Mean? In personal injury law, a tort is an injury that one person sustains at the hands of another individual, who can be held legally responsible. Two guys get into an argument at a bar, and one punches the other; upon being punched, the receiver trips, stumbles over a glass table, and falls, smashing his head hard in the process. He blacks out, an ambulance is called, and he has to go to the emergency room. The man who threw the punch knew that he might hurt his opponent, but probably didn’t intend the injury to be as intense as it was! At the same bar, the crowd is excited and rowdy after the local sports team scores big. Overexcited, one customer flips a table over while giving a high-five to his buddies; at the same time, he shoved another customer, causing them to fall over and injure himself. This is an example of a careless accident! Slander, libel or intentionally harmful rumors that one person may spread about another. Intentional Torts in Detail: What to Know. Assault and battery is a term that describes physical acts of aggression. Assault is an act that makes someone susceptible to harm (whether or not that harm occurs) while battery is aggression followed through to completion. Fraud describes when one person or entity commits an act of deception in order to benefit personally or to harm the injured party. False imprisonment can be described as when one person or entity intentionally impacts, and restricts, the freedom of another. Is Tort a Crime? Here’s the Difference Between the Two. Yes and no. Some intentional torts are also crimes. The difference, is that a tort is brought upon between individual parties; the end result of a civil case will be the rewarding of damages. A criminal case, however, is brought on by the state / government on behalf of an injured party. The result of criminal cases are not the rewarding of damages, but in the punishment of the guilty for their wrongdoing. Battery is one example of an action that can be both an intentional tort and a crime, based on how serious the offense is.